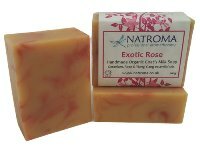 Our Natroma soaps are handmade using organic natural ingredients. You'll find they have the same bubbly, creamy lather as our other soaps since they have the same formulation, but these soaps have become very popular with customers who prefer to use organic products. These are cold process soaps and they're handmade in wooden moulds, before being hand cut and cured for 6-8 weeks. Each bar weighs at least 100g. Most of the handmade soaps on this page contain goats milk, sourced from a local organic farm and as usual they're naturally coloured with natural clays, spices, and infused botanicals. Many have pretty swirled soap patterns, so each bar will be unique and colours will vary by batch. This page also contains our 2014 charity soap - Enville. This is a real ale organic soap, and has been specially created to support Prostate Cancer UK, our chosen charity for this year. The soaps on this page are listed in the order we lay them out in our shop - from unscented down to the more highly fragranced varieties. Our Natroma soaps are suitable for all skin types, including sensitive skin. But for eczema sufferers we'd suggest that the soaps at the top of the page would be best since they contain skin-calming essential oils and were particularly formulated for delicate, troubled skin. Remember to visit our Goats Milk Soap page for more information on why goats milk soap helps sensitive skin types. This is a pure unscented organic goats milk soap which is free from any synthetic fragrances or colourings. This gentle handmade soap lathers just like our other fragranced soaps, but is particularly suited to very sensitive skin types. Unlike commercial unscented soaps, our natural soaps do not contain any tallow or animal fats, so are suitable for vegetarian customers. This is good choice for anyone with eczema or sensitive skin conditions since it is a gentle soothing organic bar, beautifully pattened with golden calendula petals. The soap also contains the spa quality rhassoul clay and carrot oil, natural ingredients that suitable for all skin types. The fragrance is subtle with blend that includes geranium, rosewood, bergamot and chamomile essential oils. This is a very gentle bar enriched with skin soothing oatmeal and rhassoul clay. The fragrance was originally developed to appeal to younger users, and includes lavender, sweet orange and chamomile with a hint of spearmint essential oils. Gentle is a nice choice for anyone who has sensitive or troubled skin including eczema or psoriasis. 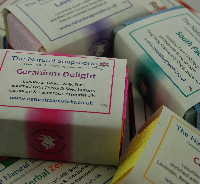 This is a lovely traditional organic soap with an aromatherapy blend that includes lavender and geranium essential oils. Each bar has been swirled with pink and purple/lilac pattern using a naturally infused alkanet oil. A lovely sophisticated blend of citrus (sweet orange, neroli and lime) and frankincense essential oils., we think this is a lovely sweet soap that's lovely to use in the morning. We've used red clay to create a pretty swirled pattern in this bar. 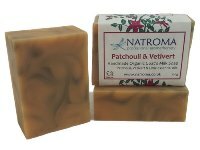 Patchouli and vetiver is fast becomong one of our top selling Natroma organic soaps, since so many customers love the earthy aroma of patchouli blended with vetiver. This bar has a pretty green swirled pattern from clay, making it another nice choice for men who like to use our soap for shaving. This is our top selling organic soap, since so many people love the blend of exotic ylang ylang with the more traditional floral notes of geranium and rose absolute. This is another pretty bar, with a swirl of pink clay against a cream coloured background. Kaleidoscope continues to be the hardest organic soap to make, because it contains 4 swirled colours - blue, purple, pink and green! This organic soap has a lovely sweet fragrance from lavender and geranium but it's lifted with fresh rosemary and spearmint. Another top selling goats milk soap, this is a beautifully sweet bar, fragranced with an exotic blend of essential oils including Ylang Ylang, Petitgrain and Lavender with a deep musky note of Vetiver. This soap is special since it also contains exotic Monoi de Tahiti oil which adds a heavenly fragrance and makes the lather even richer and more luxurious than normal. The bar is naturally coloured with swirled blue and purple patterns. De-Stress is one of our newest organic soaps, and we decided to create this bar because so many love our De-Stress range of bathing products. It's a really lovely blend of bergamot and ylang ylang with the sophistication of expensive frankincense to ground the blend. To complement the bathing products, this soap has a blue swirled pattern with pretty calendula petals. Enville is our brand new charity soap, and for once we've left out the goats milk and instead have created a real ale soap! We'd like to thank the Enville Brewery for donating some of their Enville Ale for this soap, which has a rich, bubbly lather. The fragrance is cedarwood and patchouli, and the addition of rhassoul clay makes this another great shaving soap for men. This soap was created in memory of Sarah's Dad who lost his fight with prostate cancer a few years ago, so we'll donate a pound from the sale of each bar to Prostate Cancer UK. Please buy a bar - we'd like to raise as much money as we can for this fantastic charity! Enjoy savings on our organic goats milk soaps when you purchase them in 4's. Simply mention in the notes box at the checkout if you have any fragrance preferences, otherwise we'll send a nice mixture.